August 6th is the anniversary of the US atomic bombing of Hiroshima. Honestly it's not a date that Americans are generally aware of. Nor have I seen much in Japan to publicize the date, although I believe there is an annual memorial ceremony that takes place in Hiroshima. For Americans and Japanese alike, it is a gravid topic. Many Americans feel we were justified in what we did, as evidenced by a recent poll. I used to think so, too. World War II had been raging for 6 years, and after the losses incurred in Europe and predictions of the millions of both Japanese and Americans who would die in an invasion of Japan, a resolution was needed. After visiting Hiroshima a few years ago, however, I changed my mind. I wouldn't go so far as to call Truman or the US military war criminals, but I think their decision was a mistake and made in haste. The actual reasons we dropped the bomb are debated, and I'm not going to discuss them here. Our motives may have been noble, but the ends do not justify the means. 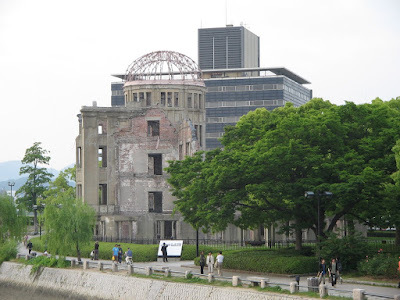 The first time I visited Hiroshima, I felt very awkward and uncomfortable. Being an American there, one feels scrutiny where there is none. I know I felt an (perhaps) irrational guilt. Visiting the Peace Park and Atomic Bomb Memorial Museum was a very moving experience. The group I was with also gifted by a speech given by a hibakusha (被爆者), an atomic bomb survivor. Her story was very sad, and I won't recount the horrors she shared. My visit did convince me, though, of Hiroshima's noble goal - not to assign blame, but to make sure atomic bombs are never used again. Nuclear proliferation is a complicated subject. I don't have any hope for global nuclear dearmament. I don't strongly support the effort, because I don't think it's a practical goal; unfortunately, some countries will probably always need such weapons as a deterant. I do pray that nuclear weapons are never used again. The A-Bomb Dome - the closest building to the blast zone to remain partially standing. Just went to Hiroshima last Monday. It's a sobering experience but, I think, an important one. I don't know if I'd go as far as to call Truman a war criminal, either, but it seems there could have been a better way to show our might and end the conflict (dropping the bomb on an uninhabited island off the coast of Japan, for example).